According to some research, at least 78% of companies are using open source in some fashion (my personal guess is that the number is higher). The fact that the Mozilla corporation realizes that it needs to give back (on top of all the work they already do), is incredibly progressive and I hope sets an example moving forward for others as it can help solve the tragedy of the commons issue that many open source projects face. the depletion of a shared resource by individuals, acting independently and rationally according to each one’s self interest, despite their understanding that depleting the common resource is contrary to their long-term best interests. The key problem here is that organizations who cannot be excluded from the benefits of a good often have little incentive to contribute toward the production of that good. This is essentially known as “free-riding” and is common in open source land, even with projects that are successful. There are many ways to tackle this problem, whether it’s through a restrictive license, guilting people to donate, or just setting up a foundation with membership rules and dues to ensure that a particular bit of software is properly funded. I think this trend will continue as long as we in the free and open source community push for it. At the end of the day, we are in it all together. The more we can convince organizations to give back, especially the ones that have strongly benefited, the more all of us will get back. My challenge to you is to push your respective organization to give back, whether that is financially or in some other way. A couple of weeks ago I had the pleasure of attending MesosCon 2015 in Seattle co-located with LinuxCon. I had the honor of being on the Program Committee this year and helped draft the program with a great group of folks. It’s really amazing to see how far things have come since we helped open source Mesos… it was great to see companies like Apple, Verizon, Bloomberg, Paypal, Intel, Cisco, Twitter, AT&T and many other adopters running Mesos with serious production workloads! I was also really proud of us having a diversity scholarship as part of the conference, that worked out really well and we will do it more in the future. Furthermore, if Seattle was a bit too far away, we are hosting MesosCon Europe in Dublin in about a month. The program isn’t live yet as we are in the community review phase for proposals so if you would like to participate in the program selection, please get your votes in! I look forward to seeing everyone in Dublin and chatting with people over some frosty beverages! I really expect this trend to continue in the future, for example Box is looking to hire their first Head of Open Source and even Guy Martin was just hired to create and run an open source office at Autodesk… Autodesk! At the end of the day, as more businesses become software companies to some nature, they will naturally depend on a plethora of open source software. Businesses will look to find ways to build better relationships with the open source communities their software depends on to maximize value for their business, it’s in their best interests. This is a 100% opt-in program for the developer, and we want to reassure you that we will NEVER bundle offers with any project without the developers consent. Outside of this just being dubious behavior, this looks to be a lie based on what the nmap developers have stated. Also, what is concerning is that who knows what other open source projects SourceForge is trying to do this for. This should be a lesson and even a wake up call to open source projects who use external services like SourceForge… there’s inherent risk if the tide of the business you depend on changes. Furthermore, this is another reason hosting your project at a quality open source foundation can be beneficial as they generally won’t do these type of shenanigans as they protect your projects best interests. These open source foundations can also help you secure a trademark for your project which can help fight against these types of issues. Last week, I spent some time moving more @TwitterOSS open source projects on GitHub to take advantage of this and have been nothing but thrilled with the results (seen build speeds improve by 30% to nearly 50%). Faster builds lower the barrier to contribution and also translate into less wasted time. Anyways, check it out, more people need to know about this rely on Travis CI. We generally don’t see this type of thing in open source communities (mostly just contributions without tests), but I believe malicious contributions will continue and become more frequent. The opportunity is just there for bad actors and open source code is embedded all over the place, from your desktop, to your mobile devices to vehicles. I couldn’t resist writing a blog about this topic given the chance to use a witty blog title. A few years ago, I blogged about a post that Mike Rogers (@mikeal) wrote about “Apache considered harmful” in the GitHub era. I agreed with Mike to an extent, but mostly around my frustration in how slow the ASF was in adopting newer tools (like Git) and how the organization was structured with volunteers responsible for critical infrastructure. However, we can save that frustration for another post (note: this has improved as of late). The foundations I mentioned above have over a decade of experience being built for the sole purpose of allowing independent open source communities to flourish with fair governance models built on meritocratic behaviors (just take a peak at some of the Apache documentation or Eclipse development process). This is important because the incentives between individuals small companies, large companies, heavily funded companies and even academics are different and need to be accounted for in a fair open source governance structure. Some of these foundations like the Eclipse Foundation started out as the “Eclipse Consortium” and learned some of these lessons the hard way. In particular, I would like to call out the Eclipse Foundation Working Groups and Linux Foundation Collaborative Projects concepts as some of the best ways to collaborate in the open for maturing open source projects. 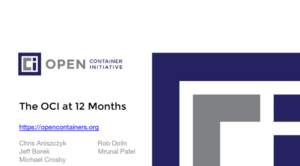 What happened with Docker/Rocket was almost predictable given the way the Docker project was structured and how late to the game they were in establishing some level of governance and independence as more larger companies were getting involved. At least the competition should help container technology improve at a quicker pace. Rocket/Docker and Node/IO.js show that foundations like Apache and Outercurve are more important than ever to ensure FOSS neutrality. I hope that in the future as new open source projects become successful, they take a serious look at open source foundations (especially the ones I mentioned) as a proper place to grow and provide structure to their community. Their communities deserve it.